One of the major conditions our dentists will assess your mouth for during a routine check-up is gum disease, as this can greatly affect your oral health. Our team are both experienced and highly trained within this field, with Dr Park having a particular passion for the topic. In its early stages, gum disease is known as Gingivitis, and this condition can successfully be reversed with daily brushing, flossing and regular cleans by a dentist. Gingivitis is caused by a build-up of plaque both on and around the teeth, resulting in minor infection and inflammation. This form of gum disease does not include any loss of bone and tissue that hold teeth in place, however the longer plaque and tartar are on teeth, the more harmful (and hardened) they become. 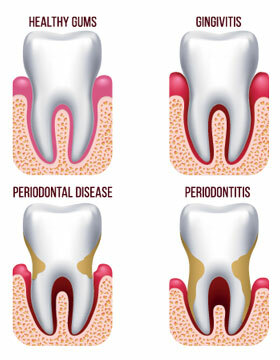 If left untreated, Gingivitis can advance to a condition known as Periodontitis (meaning “inflammation around the tooth”). This causes the gums to pull away from the teeth and form infected ‘pockets’. The body’s immune system fights the bacteria as the plaque spreads and grows below the gum line, however this actually causes the bone to break down, along with the connective tissues that hold the teeth in place. Without successful treatment, the bones, gums, and connective tissue that support the teeth are destroyed, resulting in loose teeth that require removal. Early intervention by a dentist can reverse the effects of gum disease, so if you’re experiencing any of the symptoms listed above, please come and see us. Call (07) 3883 2434 today to schedule a consultation with our professional team!